One day the king and his friend were out on a hunting expedition. The friend would load and prepare the guns for the king. The friend had apparently done something wrong in preparing one of the guns, for after taking the gun from his friend, the king fired it and his thumb was blown off. Examining the situation the friend remarked as usual, “This is good.” To which the king replied, “No, this is NOT good!” and proceeded to send his friend to jail. About a year later, the king was hunting in an area of which he should have known to stay clear. Cannibals captured him and took them to their village. They tied his hands, stacked some wood, set up a stake and bound him to the stake. As they came near to set fire to the wood, they noticed that the king was missing a thumb. Being superstitious, they never ate anyone that was less than whole. So untying the king, they sent him on his way. The king then proceeded to tell the friend all that had just happened. “And so I am very sorry for sending you to jail for so long. It was bad for me to do this,” the ruler said. Remember, maybe not everything that happens to you seems good at the moment, but God has a plan and He is always working all things together for your good! We tell the people who choose to be nice or considerate to our need “Thank You!” It’s in our DNA… we are people who can admire, respect, do good to others, appreciate, and be thankful. Grateful for all the many blessings we’ve received, either noticed or unnoticed. An old country preacher once said: Nothing is ever settled until it’s settled right—and nothing is ever settled right until it’s settled with God. 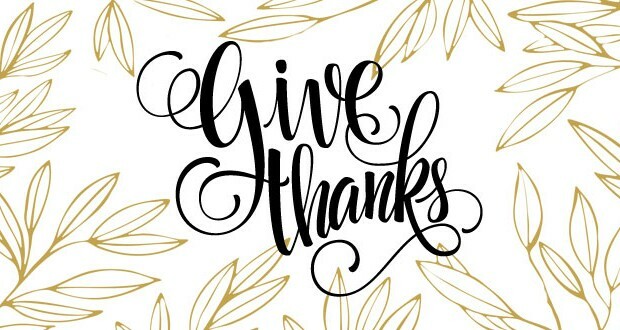 Enjoy this Thanksgiving with a renewed sense of gratefulness! Try being the first one to smile. Start your day by counting your blessings. If you choose to be happy instead of gloomy, do you know what will happen? You’ll be like a magnet attracting people who want to be joyful and happy. People will be attracted to your charm! Pastor Giovinetti is senior pastor of Mission Valley Christian Fellowship. A former entertainer in Las Vegas and Reno, Nevada, Giovinetti is also the host of “Real Life Radio,” which is broadcast nationally. Listening to the wrong voice: Who told you that you were naked?